St. Patrick’s Day is celebrated around the world as an honoring of St. Patrick, the patron saint of Ireland. In the United States, people love to hold parades, attend parties, and, of course, wear green! You’ll see green everywhere on St. Patrick’s Day, and Blair Candy loves to join in the fun by featuring a whole bunch of green sweets as St. Patrick’s Day candy! 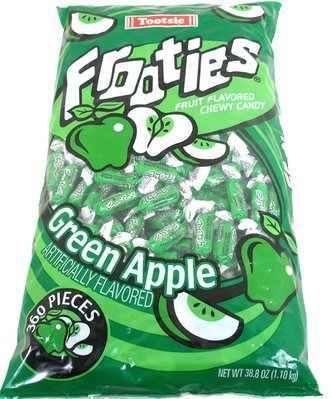 First up, as you can see above, we’ve got green Frooties in green apple flavor. These sugary chews are mouthwateringly good and will leave you wanting so many more. Another green candy is our gummy apple rings, colored in green and white. Mini chocolate balls in either lime green or dark green are always a favorite. The candied mini balls of chocolate are bite sized and are so delicious that we’re betting you can’t eat just one. And the list of green candies just goes on and on! Lite green rock candy, green apple or watermelon Air Heads, apple Laffy Taffy, and many others are all part of this group, and they’re all featuring right now for St. Patrick’s Day. Be sure to get your St. Patrick’s Day candy before it sells out, right now on BlairCandy.com! With St. Patrick’s Day just around the corner, Blair Candy is getting its Irish on with lucky gold chocolate coins for the end of your rainbow! Chocolate penny candy is always popular St. Patrick’s Day candy, so we wanted to highlight our stock of it while you’ve still got time left before the holiday. We’ve got two major types of chocolate coins: chocolate quarters and chocolate half dollars. Each type is available in sizes of two pounds or twenty-four pounds. 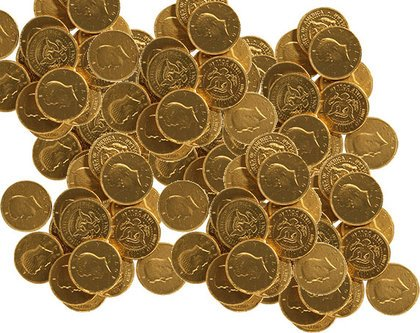 The quarters are wrapped in gold foil made to resemble American quarters. It’ll be fun to buy these in bulk and set them out around the house for people to enjoy throughout March. And, of course, they make great little candy gifts for your family and friends, too! The other type of chocolate penny candy we carry is chocolate half dollars. Resembling American half dollars, these will also be fun to pour into a bowl and leave out for others to enjoy. All of these coins are made from creamy milk chocolate and will have you coming back for seconds, thirds, and so on. You can shop for chocolate penny candy and other St. Patrick’s Day candy (including tons of green stuff!) right now on BlairCandy.com! We bet a bunch of you are throwing Christmas parties this month. When a party’s on your agenda, you have a lot to think about, including what you’re going to feed everyone. For a Christmas party, could we possibly suggest…Christmas candy in bulk? And as a retailer of wholesale candy, we at Blair Candy have a ton of this. The thing to remember when stocking the candy for a Christmas party is that the candy first has to be tasty and then needs to be fun. Sometimes you don’t get those two qualities together. But let us recommend some candy that is both delicious and packed with holiday fun! • Snickers Trees. 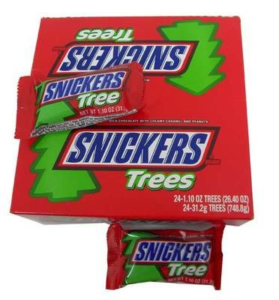 These are classic Snickers as you’ve always known them, but in the shape of Christmas trees. That pulls the whole thing together! When it’s Christmas, your party guests will want Christmas-themed candy, and this will fit the bill. • Christmas Pez Dispensers. Hey, Pez dispensers! People have been loving these for decades, and now we’ve got them in Christmas characters. Give your guests the gift of delicious Pez candy packed inside super fun and cute dispensers featuring Santa, reindeer, and more! The dispensers always make great keepsakes! • Reese’s White Chocolate Peanut Butter Trees. It’s Reese’s, okay? You know it’s going to be good. Scrumptious white chocolate encases yummy peanut butter in these little Christmas tree shapes. See, this kind of stuff gets people in the holiday spirit! So start stocking up now before the holidays actually get here! Get your Christmas candy in bulk for your party from wholesale candy retailer BlairCandy.com! Gummies seem to us to be unique among candies in that they can be flavored to taste like basically anything and are just so soft and sugary sweet that they become irresistible. Go ahead, try eating just one gummy out of a bag. We bet you can’t do it. 1. 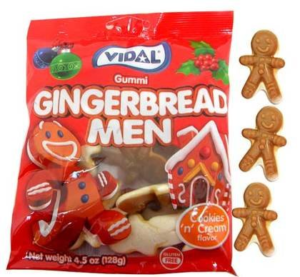 Vidal’s Gummi Gingerbread Men. These are awesome. Why? When you open a bag you get that whoosh of gingerbread scent. You won’t be able to stop after that. The smell, the adorable gingerbread men. Go ahead, eat up. It’s okay. 2. Vidal’s Gummi Christmas Trees. Gummy Christmas trees are here to light up your winter nights. These red and green trees, flavored as strawberry and apple, are coated with sugar, making them a sumptuously sweet Christmas snack and a fun stocking stuffer. 3. Vidal’s Gummy Santas. Vidal has the gummies! This time, it’s gummi Santas, each one dressed in a classic Santa hat of either red or green and flavored as strawberry or apple. Like the others, they’re just irresistible. Christmas is almost here! Don’t miss any of this holiday gummy candy this season. Shop it all right now on BlairCandy.com! 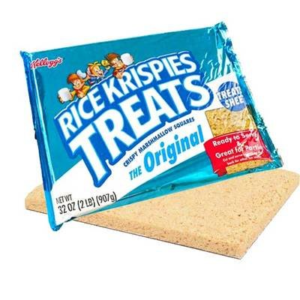 For a Most Unusual and Tasty Christmas Candy in Bulk, Have a Look at a Giant Rice Krispies Treat! Everyone loves getting surprised by unique Christmas gifts under the tree, right? As long as it’s something different and unexpected, it’ll probably do the job. Here’s yet another awesome candy suggestion for you this Christmas season: a giant Rice Krispies Treat sheet weighing a whopping two pounds! • Cut the sheet into perfect squares to hand out at a party or to guests. This would be fun if you want to make your own mini Rice Krispies Treats for yourself and all your family and friends. • Get a cookie cutter to press into the sheet and make shapes! This is a fun idea. Who says cookie cutters are just for cookies? You have a 2-pound sheet to work with, so have at it with the cutter pressing. What fun shapes will you make? • Add your own toppings to the gigantic sheet. What’s your favorite topping? Throw some chocolate on there, M&M’s, peanut butter, or all of it together! Spread it on, cool the whole thing so the toppings harden, and then serve it all for an extra special Rice Krispies holiday treat! There’s a lot of fun you can have with this Christmas candy in bulk! Enjoy this 2-pound sheet yourself or gift it to someone else and watch the delight spread across their face! For more fun Christmas candy gift ideas, keep browsing BlairCandy.com! Now, first up is a chocolate Harry Potter wand, a delightful candy made in stunning detail. Inside each of these Christmas candy boxes is a wand that’s 9 and a half inches long and made with a finely detailed handle, just like in the movies! Adding to the fun is a wizard’s spell sheet you can use to cast all your favorite spells. 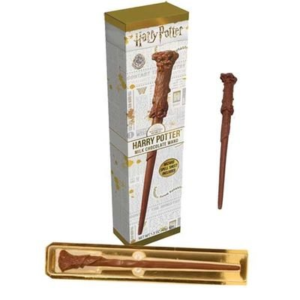 This chocolate wand will make the perfect Christmas gift for that Harry Potter fan in your family. Next up we have a Harry Potter chocolate frog, made of yummy milk chocolate with rice mixed throughout. Now that’s going to be delicious. Each chocolate frog comes with a collectible card featuring wizards and witches from the Harry Potter films and books. Finally, we’ve got Christmas candy boxes of chocolate Harry Potter house crests. Each box contains four crests for each of the four Hogwarts houses: Gryffindor, Slytherin, Ravenclaw, and Hufflepuff. Stickers of the four crests are also contained in the boxes. If you know a Harry Potter fan (or a chocolate fan), you’ve just got to make one of these Harry Potter chocolates a stocking stuffer this Christmas! You know you can always trust BlairCandy.com to have those unique candy ideas for you! And go check out the rest of our supply this season! Obviously, in life, you need to accept the good with the bad. We all know it: if you want to own a car, you’ve got to buy gas, upkeep it, etc. Well, the same goes for Christmas. Sure, it’s the holidays. Everything is decorated with lovely wreaths and snowmen, people are buying gifts for one another, and everyone seems to be in a good mood. Then there’s the cold. Many parts of the United States and the rest of the world get cold and snowy at this time of year, and the truth is, it’s tough out there, especially when temperatures drop into the single digits. But let us at Blair Candy offer you a little something to cheer you up this winter season: Hershey holiday candy! 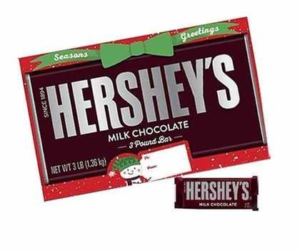 And not just any kind of Hershey holiday candy: a gigantic Hershey’s milk chocolate bar weighing in at three pounds! This is all the classic yummy Hershey’s chocolate you know and love, but in giant form! The thing is, a three-pound Hershey bar is going to last awhile (at least, we hope it will), but that’s basically the idea. We want this gigantic chocolate bar to take you through all winter and keep that holiday cheer going until the weather warms up. Not a bad idea, right? Yet another idea is to give the same joy to someone else. If you can fit this thing into someone’s Christmas stocking, do it, and really make their Christmas a sweet one. What are you waiting for? Shop for all our Hershey holiday candy right now on BlairCandy.com! Asher’s chocolate is a truly fine candy delicacy. Making chocolates since 1892, the company has earned a place in all of our hearts with its lovely confectionary creations that include milk chocolate peanut butter trees, milk chocolate pretzel bites, and dark chocolate Peppermint Pals, pictured above. 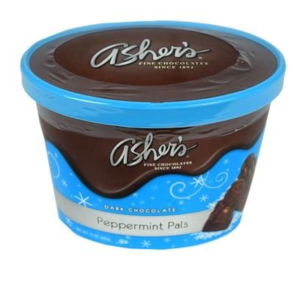 You know to expect sugary greatness with any Christmas candy boxes made by Asher’s, and that’s exactly what you get with this tub: a peppermint cream center surrounded by rich dark chocolate. Yum! Sure, dark chocolate tastes a bit different from milk chocolate, but if you’ve never had it before, give it a try! It’s not only rich and delicious: it’s also super good for you! So stock up on some Christmas dark chocolate right now from BlairCandy.com, an experienced wholesale candy retailer! Oldies but goodies – we bet you hear that a lot, about many things. The wisdom is often true, as so many things of old are sturdier, higher quality, tastier, and simply better than new things. This varies case by case, but offer us some good old-fashioned Christmas candy any day and see how fast we take it! In this post, we’d like to highlight another old candy classic: Brach’s. The Illinois-based confectionary, part of the larger Ferrara Candy Company, was established in 1904 and has been creating yummy gummies and other candy for the world public ever since. Being that it’s the holidays now, Brach’s of course is at it again, making its numerous Christmas-themed offerings available for perusal and, of course, consumption! 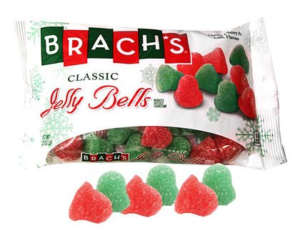 Spotlighted here are Brach’s classic Jelly Bells, a most unique Christmas candy that is one of our personal favorites! These little sugar-coated gummies are red and green for the holidays and shaped like Christmas bells. But best of all is the surprise in the recipe: these little jelly candies are made with actual fruit juice! Ah, now that’s tasty! So what do you get when you combine Brach’s with an old-fashioned Christmas candy gum drop? A gingerbread house decoration, a candy buffet adornment, and a totally yummy Christmas candy option! Get yours now from BlairCandy.com! One candy that all our customers at Blair Candy seem to love year-round is gummy candy. People grow up loving it and never forget about it when they’re adults. And over time, we also get to know and remember certain brand names of candies we’ve enjoyed throughout our lives. Haribo is of course one of those famous names in the candy industry. Its gummy candies have been delighting people around the world for generations. The German confectionary company Haribo was founded in 1920 and is now headquartered in the city of Bonn. As we’re sure you’ve noticed, Haribo makes a ton of gummies that are popular around the holidays. 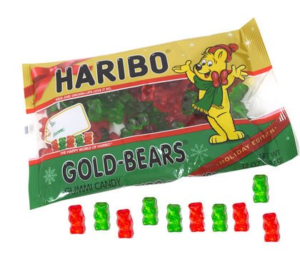 From Easter bunnies, to creepy Halloween creatures, and now to red and green Christmas bears, Haribo has you covered for holiday gummy candy in bulk. One bite of any of its chewable treats and you immediately remember that soft, sugary taste that hooked you in the first place. The red and green colors of the gummy bears pictured above would make perfect additions to any Christmas candy buffet. What will you do with yours? Pour them into a clear glass bowl? Have them line the icing on a Christmas cake or cupcake? Maybe attach them to an intricately decorated gingerbread house? Do whatever you want, as long as you eat and enjoy them! When you’re shopping for Christmas candy this month, remember the names: Haribo and BlairCandy.com!